I can access product attributes (product-> attributes) on a product model but I cannot access the product attributes on Ad model (ad->product->attributes). What is wrong? 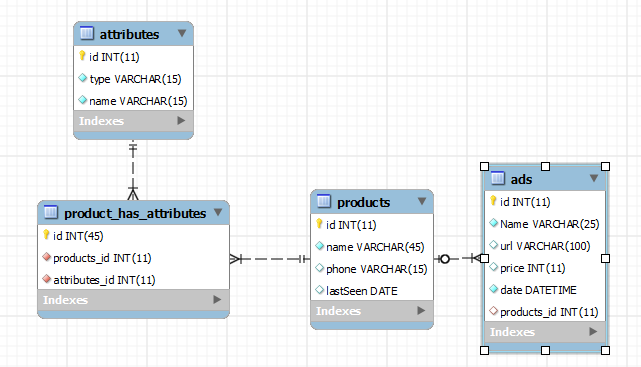 How do I access the relation Ad->product->attribute from my Ad model ? Perhaps the problem could be that you're not using CakePHP's conventions. "new join table’s name needs to include the names of both models involved, in alphabetical order, and separated with an underscore ( _ )." So, your join table should be named attributes_products. Also, check your foreign keys. They should be in singular form. Hopefully that solves the problem. I can think of a couple of simple ways to accomplish this. That would be the simplest code change to make sure you get attributes that are related to the product that is returned. I have had issues with Cake not liking my find conditions when using related models in conditions, and I'm not sure of the proper syntax, but if you wanted to pursue that, I'm sure you can track it down through the docs or by experimentation. Finally, I would advise you to check into the ContainableBehavior, which will allow you to fine tune which fields are actually returned in the results. I hope this answers your question!